The Boeing XB-44 Superfortress was a United States B-29 Superfortress bomber aircraft upgraded with Pratt & Whitney R-4360-33 Wasp Major radial engines of 3,000 horsepower (2,200 kW) takeoff rating, in place of the production engines rated at 2,200 hp (1,600 kW) takeoff rating. 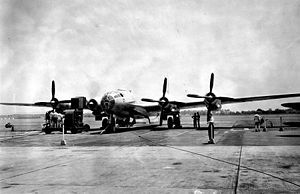 The program began in mid-1943, when Pratt & Whitney proposed to the United States Army Air Forces (USAAF) that the B-29 be modified with larger engines. In July 1944, a contract was signed and one B-29A-5-BN (s/n 42-93845) was made available to P & W for developmental work. Modification involved complete redesign of the four engine nacelles, including the addition of a large airscoop below each cowling. Because the aircraft was intended to be only a testbed for the engine installation, most of its defensive equipment was removed before testing. Two machine guns in the rear fuselage were left in place. Only the one aircraft was used in the B-44 flight test program. First flying in May 1945, the XB-44 proved 50-60 mph faster than the B-29 (available sources do not indicate how much of this increased speed was due to differing aircraft weight or to deleted armament). However, according to Peter M. Bowers, a long-time Boeing employee and small aircraft designer, and a well-known authority on Boeing aircraft, "the redesignation was an outright military ruse to win appropriations for the procurement of an aeroplane that by its designation appeared to be merely a later version of an existing model that was being canceled wholesale, with many existing examples being put into dead storage." When the R-4360 was first developed, its takeoff power rating was 3000 horsepower. By the time it was incorporated into the B-50, its MTO rating was 3,500 horsepower (2,600 kW), and even higher when used in other aircraft (e.g., 3800 in the Convair B-36). Much of the difference is due to differing turbochargers installed in the different aircraft (the engine also contains a supercharger, gear-driven by the crankshaft).